Retail photography – what is its future? Retail photography chains in the USA and the UK have closed or restructured. The big news this week is that another high profile retail photography chain has closed. Calumet, the retail photography business in the United States suddenly collapsed. Over night the entire business has closed. Calumet Photographic operated 14 stores in America. They had branches in New York, Washington and Los Angeles. Opened 75 years ago this was a foundation business in the U.S. photographic industry. The retail photography business has been badly hit recently. In the United Kingdom in January 2013 a similar shock closure occurred. Jessops had 187 stores. The company went into administration closing them all within a few days. The Jessops website has since re-opened for business. Jessops shops have also re-opened under different management. These new openings have seemed to save many of the local retail photography outlets. Overall, photography appears to be in rude health. So why is the retail side suffering so badly? It seems trite to just say the Internet has taken over. Amazon and a few other strong online businesses have taken a big portion of the sales. Who has not gone online to compare prices or check on the “spec” on the latest equipment? Of course we have all done that. We have also spent lots of money on web sites buying photo-equipment. However, I profess to being less than satisfied with some of those purchases. Have any of us gone online to converse with the retailer about a lens? Which of us has discussed the tripod best suited to our needs with a web site? Yes, these points question our commitment to a lot of Internet retail activity. Many of us simply feel uncomfortable buying expensive equipment on just a specification. What is missing? Is there room for service in retail photography? I think it is a good time to review the business model of retail photography companies. The Internet has done a lot for pricing and retail consumerism. Many things have universal appeal and are inexpensive. They are suited to Internet purchase. We see them for sale a lot. We know the properties and prices of these items. Buying them online is easy. There is no challenge and we have often made a decision before going online. When it comes to spending thousands of pounds on, say, a camera, the decision is more in the balance. For me the shame about losing retail photography outlets is not about pricing. It is about the loss of personal guidance and expertise found in the “local-guy” shops. That is especially true for learners and young professionals. Losing local camera shops has taken expertise out of the business and local regions. Looking honestly at the businesses that have closed I think there is one thing in common. They had stripped the business down to compete with the websites. They often had low paid workers, untrained, working for long hours. The business was aimed at pumping consumer cameras over the counter. In recent years camera shops have looked more and more like catalogue outlets. I know that my local shop was like that. The shop was almost always bare and you could rarely get good advice. That is not going to cut it in a modern online economy. The competition is too sharp. The little local guy needs to fight on another front. Every two or three years I have to spend big sums on new equipment. In between I spend other amounts which often add up to big sums. It is important to ensure my equipment is viable for my business. At the moment nearly all that money is spent online. For photography equipment I would like to go into a local shop. I want sound advice. That advice should be based on years of experience in the photographic realm and successful sales. I would expect a good stock. I want to have pleasant and expert help. I want to get insights into alternative pieces of equipment. I want to feel that I have been shown what is available and how it all compares. I cannot get any of that on retail web sites. In fact I have found it difficult to get that on any Internet site. Reviews and pictures are no substitute for handling an item. It is more useful to pop it on the camera and try it out. Great advice and try-outs really help buyers. For my penny-worth I would like to see a retail photography model built on service. Yes, that might cost slightly more. But I know that good service and knowledge will give me more confidence in the purchase. It will also give me a chance to try things out in the shop. Both are invaluable to someone spending a lot of money. 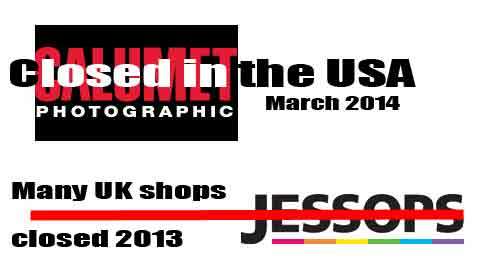 The re-opening of more than 70 Jessops shops last year give us hope. I for one would like to see those service based shops in the USA also re-open under enthusiastic and expert staff. Service is king. The retail photography industry can still work if it is based on service. xJessops stores: What are they now? This entry was posted in Photography and tagged Calumet, camera shops, Jessops, retail photography. Bookmark the permalink. Oh Damon, don’t get me wrong. I don’t go with all the bells and whistles. I will hang on to my 7D. What i meant is that if I ever go that route, there are so many choices. Fuji is making waves with their cameras and sensors are getting ridicously better. Look at Sony and what they’re doing. I’d love to go full frame someday. 5d mark III is apealing, but then look at the Sony A99. But I agree that you chose what’s best for you. I don’t make a living with Photography, but I do strive for quality. Agreed! And you are right. Quality is the key issue. After all, you want your camera to last and to keep producing great pictures. But, also, yes, the camera you buy should always be the one that suits your need. The nice thing about all this is that the day I decide to upgrade,camera technology will have evolved to the latest and greatest, therefore more fun choices. Yes, true. But I think that the pace of camera development is slowing slightly. Also, remember the latest technology is not necessarily the best for you. Choose your camera on the basis of what you need. Not on the basis of what is the latest development. Luckily there is still Adorama and B&H in NY and handle both online and retail. Here in Puerto Rico we had 2 retailers in the days of film but they have long been gone. The only place right now where I can go if I ever decide to get a nice camera is Best Buy. I bought my Canon 7D in Sears on luck, because I have not seen this camera in store again. Unless I take a trip to NY city, my option is online for now. Hi Jose, Great to hear from you. Yes, it is a sad fact that the distribution of local shops is uneven. Indeed it is lucky that the Internet can fill those Gaps. However, I believe that a post Internet resurgence of “service-based” shopping experiences will bring back many of the stores that serve premium priced goods. Photographic equipment is among that range too. So, here’s to a future where we can all get equipment at reasonable prices with good personal service too! I run into an interesting problem with my “local” guy. He only carries two brands- Nikon and Olympus- but when I upgrade I want to go with a Canon. Thankfully I’ve found a shop that sells Canon about an hour from here. It’ll be a hike, but worth it. I’m not sure why, but it seems that in this region, camera companies will not allow their customers (i.e. the local guy) to carry the competition. That’s a bit sort sighted in my view. I am guessing that there is some sort of agreement in the background. I have never heard of that before. At least you have another local(ish) option. I buy most of my equipment at my local Dodd’s store – however, I always go in armed with the internet price. They will always meet it. I used to deal with Cord camera but all of their stores closed in Cincinnati as did Ritz last year. I like to talk to folks, bug them if I don’t get things the way I want and have a guy that will talk me through what I really need. That is why I shop global and buy local. Support of our local shops is a good thing. We should be demanding service and a good stock. But we also need to do just what you did. Make sure that we get the price but buy local. Well done.